This beautiful Dream Catcher is made for us by Native American Artist Patricia Pacheco. Patricia's mother is Ojibway (Chippewa) and her father from the Laguna Pueblo. She has made a few of these wonderful dream catchers for us. 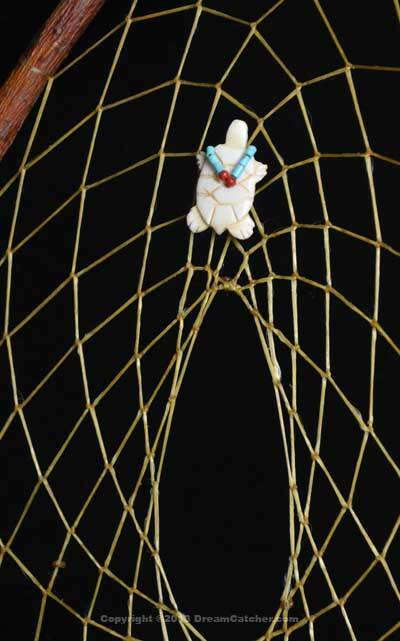 This dream catcher is unique and has a beautifully carved bone turtle on it.The turtle has a turquoise and red coral necklace. The bottom of the dream catcher is adorned with duck feathers. The coral is from the sea, the turquoise is from the earth. Together they help protect the dreamer. The duck and feathers are sent to Patricia from her brother from birds he hunts. All sizes are approximations due to the natural materials used sizes may vary slightly. All items we sell we guarantee. If you are not happy with it when it arrives please let us know. We only have a few of these beautiful pieces and we may not get any more of this same design. If you like it , buy it before it is gone for good!